Christmas is a universal time of celebration, though the event is celebrated in different ways by different communities across the world. While Christmas is a single day, the Christmas period often involves a lot of preparations starting in November or even earlier. For many people Christmas also involves Music, and there are special pieces of music which are strongly associated with Christmas and rarely heard outside the Christmas period. A number of classical composers have written Christmas music and we list a number of examples later in this article but first let us consider the topic of Christmas Songs. 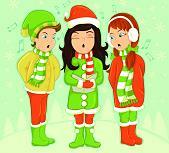 Among the many songs we hear at Christmas are Christmas Carols, traditionally sung by Christmas carollers. 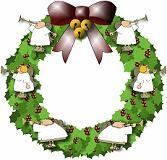 Some Carols are Hymns celebrating the birth of Jesus Christ, while other Carols are Folk Songs about Christmas events. 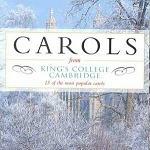 There are also many popular songs about Christmas which have also become traditional. To become a "Christmas Song" you only have to mention or suggest snow, snowmen, sleigh-rides, Santa Claus, bells, reindeer or a Christmas tree. Once you have written a successful Christmas Song, you can be assured that it will be played regularly on radio or television, in shops and in other public places.